The European Union’s new plan for restricting conflict materials in global trade starts with good intentions, but basically ends there. People in conflict zones don’t have a choice about living the midst of perpetual civil war, don’t choose to become child laborers and do not volunteer for enslavement in militia-controlled mines. But when it comes to the social responsibilities of companies that profit from the trade in conflict minerals, responding to such atrocities is mostly a matter of voluntarism. The European Union’s new plan for restricting conflict minerals in global trade starts with good intentions, but basically ends there. The European Commission’s draft legislation, slated for implementation in 2015, aims to designate “responsible importers” that voluntarily keep their supply chains free of materials used to finance armed conflict, primarily sourced from the Democratic Republic of Congo, Angola and South Sudan. 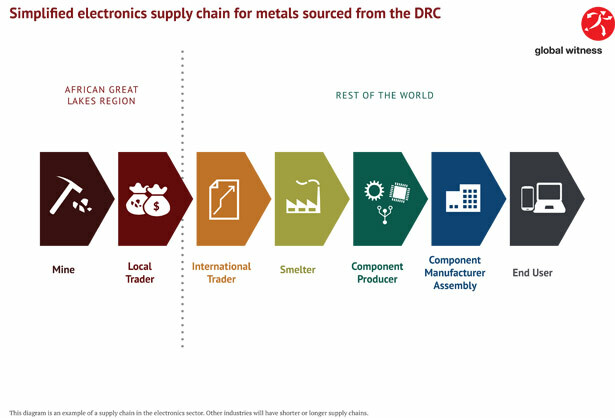 The plan covers four key minerals integral to electronic products like cellphones—tin, tantalum, tungsten and gold—through a “self-certification” scheme based on global ethical sourcing guidelines. But since it is not mandatory, and therefore only targets companies that voluntarily opt in, rights groups worry that the scheme would codify the trend of letting the fox guard the multinational henhouse. And it’s a very small henhouse at that. The rules focus on European-based businesses dealing with raw materials, particularly smelters and refiners—and not companies that trade in imported, finished manufactured products that drive European consumer markets. Thus, as Euractiv reports, the program “will not apply to importers of products such as mobile phones, which may already have had the materials installed.” In other words, the dirty minerals can be present throughout the supply chain, but as long as the closest links are clean, corporate impunity will persist for the imported electronic gadgets bearing conflict-tainted metals in their circuitry. The political impetus for the EU initiative, ironically, comes from Washington—which often lags behind Europe in regulating big business—through a clause in the 2010 Dodd-Frank financial reform law. The law mandates that big firms listed on the US stock exchange disclose information on conflict minerals in their supply chains. The disclosure rules are based on the OECD’s official due diligence guidelines for Responsible Supply Chains. But unlike the US program, the EU’s plan does not impose mandatory disclosure, which, according to activists, renders it effectively toothless. 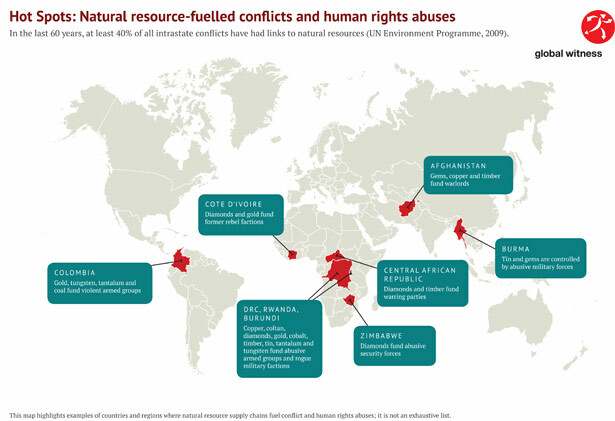 Since the 1990s, when Africa’s “conflict diamonds” erupted as a global scandal, the issue of “conflict trades” has expanded to cover various minerals linked to rights abuses in resource-rich areas from Burma to Colombia. The ubiquity of these materials in world markets provides a platform for campaigners to demand stronger policies for multinational accountability. Yet the most high-profile response so far has been led not so much by state regulators, but rather by image-conscious brands like Intel and Hewlett Packard, which have launched much-hyped voluntary auditing programs, in which they commission their own inspections of overseas smelters and supplier firms. In the absence of a strong regulatory structure independent of business interests, the proliferation of self-certification schemes among tech firms reflects the honor-system model that many multinationals have used to boost their “corporate social responsibility” credentials: WalMart has commissioned rubber-stamp safety audits in Bangladesh sweatshops; Apple has partnered with a corporate-friendly third-party auditor to monitor labor conditions in its Chinese supplier factories. Still, the overarching structure of corporate power has thwarted political initiatives to impose regulatory strictures, leaving consumers with self-regulatory schemes that grassroots groups dismiss as glorified public-relations schemes. 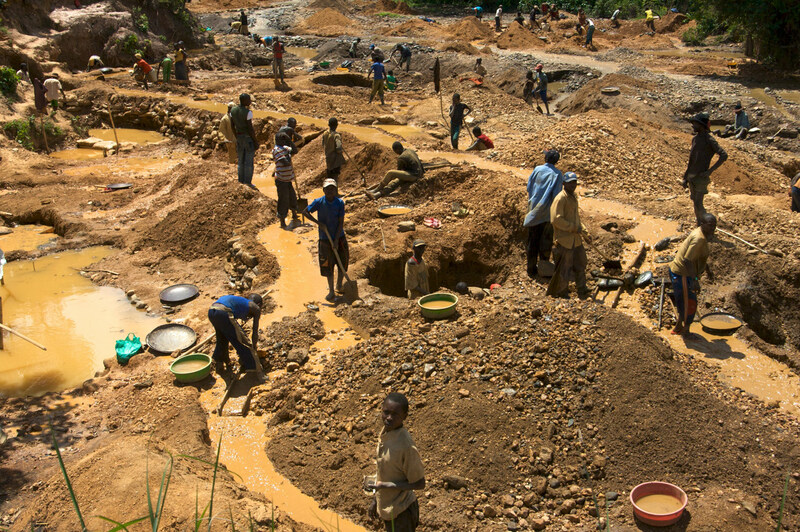 In the response to the profits extracted from DR Congo, so far, the main program to curb the conflict diamond trade, the Kimberly Process, has been dismissed as a political failure, with member states failing to use sanctions to enforce trade rules. The bottom line for advocates is that the role of government regulators is to mandate that corporations comply with global standards, not to have them “opt in” for a certificate of approval. At the same time, the focus on conflict minerals as something corporations can neatly excise from their supply chains, with voluntary due diligence, obscures the fundamental economic justice issues at stake—this lethal commerce is not just implicated in brutal warfare, but in systems of forced labor and child labor in extractive industries, entrenched poverty in war-torn areas, the rampant exploitation of small-scale artisanal gold miners in Africa’s Great Lakes region and other abuses that violate fundamental rights to a safe labor environment and freedom of movement, to say nothing of the rights to freedom of association or a decent livelihood. Those social costs do not register on corporate balance sheets, or international trade policy agendas, or our shopping lists. While global supply chains become ever-more commercially integrated, consumers are increasingly detached from the humanitarian implications of globalized production.